Nice idea. Could this principle apply to TRIP? Could you allow users to decide if a result is good or bad? Could they vote ‘Digg’ style to say if that result was good or not? A ‘thumbs down’ means that result scores less well next time, a ‘thumbs up’ scores higher and no score means the same score next time. I’ve mocked up what a ‘TRIP meets Digg’ might look like. Below is the cummulative zeitgeist for the four months since we’ve moved to free access. In that time we have been searched 806,715 times. 448 views. Growth reference charts for the UK. Royal College of Paediatrics and Child Health. 257 views. Guidelines for the administration of blood components. Australian & New Zealand Society of Blood Transfusion. 251 views. Buprenorphine transdermal patches (Norspan) for chronic severe pain. National Prescribing Service. 242 views. Nutrition support in adults. NICE. 228 views. Management of patients with dementia. SIGN. 222 views. Guidelines for Blood Grouping & Antibody Screening in the Antenatal & Perinatal Setting. Australian & New Zealand Society of Blood Transfusion. 216 views. Guidelines for the management of enteral tube feeding in adults. CREST. 205 views. Failure to thrive. Ganfyd. 201 views. Lower back pain. PRODIGY. An interesting and mixed list. More comment of the above over the next week or so. Christmas is just around the corner and things are starting to settle down. In other words the number of questions we’re answering has started to drop and the number of searches on TRIP has declined. So we’re having a gentle relax until the upswing of activity in 2007. I’m hoping our servers have a nice break too! Thank you to everyone who has supported us in 2006. 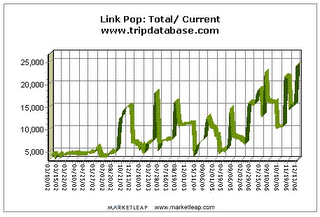 I started 2006 hoping to have TRIP free-access by the end of the year. In the end this important event happened in September, earlier than I had hoped. The move to free-access will be my defining memory for 2006. For 2007, it’s got to be…..
jon and the rest of the TRIP team. “You” have been named as Time magazine’s Person of the Year for the growth and influence of user-generated content on the internet. 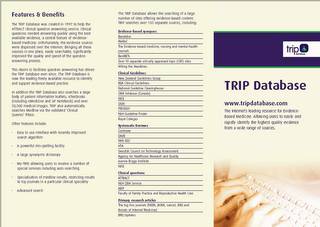 We have just taken delivery of the TRIP Database leaflets – very nice they look too! If you would like to order some, let us know via the Contact Us section of TRIP (with your mailing address). We are envisaging sending 50 leaflets per ‘order’ but if you want more or less, just let us know. For those who have recently requested leaflets we’ll send them out ASAP. It would appear that the NEJM and BMJ are both redeveloping their site. The NEJM beta site has some innovative features including a search widget for the Yahoo toolbar (but not the industry ‘standard’ Google) and a rather nice new search feature. 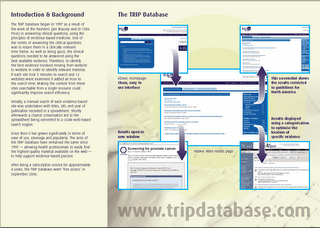 As TRIP has done for years it returns results using a hierarchical display. Their hierarchy is different including ‘most recent articles’, ‘most viewed articles’ and ‘reviews’. The BMJ has a redevelopment blog. 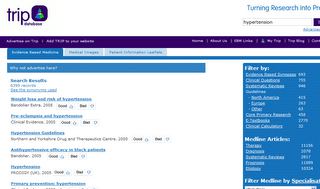 I’ve always liked the BMJ website, except when they removed free-access. It appears they are embracing web 2.0 – except for a really crucial part – today, it is about the advertiser paying, not the end user. Will this mixed approach work? I’m sure it will the new site will be a big ‘hit’. But making it free-access (albeit via a login) would allow greater access, and quite possibly even more financially viable…. From our search statistics it’s clear to see how our use has dramatically increased. But what about sites linking to TRIP? Using the Maketleap link popularity check allows links to TRIP, aggregated from numerous search engines, to be measured. These figures stretch back to 2002. Not sure how meaningful the graph is. But as with the search statistics it’s heading in the right direction.